Hi, my name’s Monkey. I attend fourth grade at Rainbow elementary, also known as Chrom-El. With all the stuff that happens at our school, it truly is a colorful place. 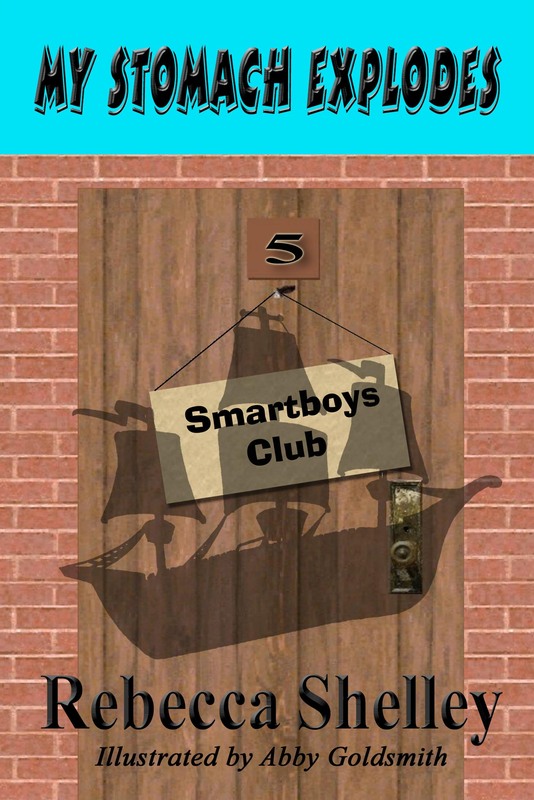 My friends in the Smartboys Club and I have had to deal with everything from ninjas to ghosts. But none of that prepared us for Mrs. Red’s announcement a few days before Thanksgiving recess. Bean froze with his pencil an inch away from the sharpener. Art looked up from his drawing of Pilgrims. 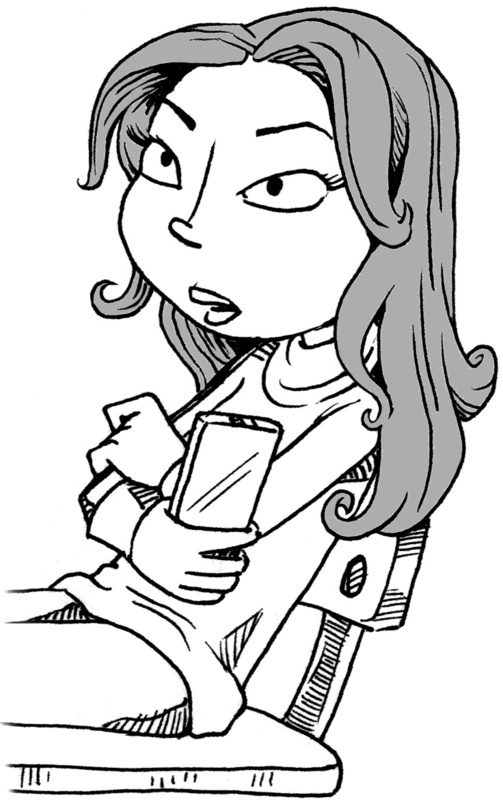 Vinny raised her hand and asked if the park had Wi-Fi internet. The whole class stared at Mrs. Red in stunned silence. I reached in my desk and fingered my ebook reader. It had a long enough battery life that it could last a couple of days at least without recharging. With my luck, my mom wouldn’t let me take it anyway. “Yes, we get to be Pilgrims,” Bean shouted and did a happy dance back to his desk. Mrs. Red started to write his name up on the board for being out of his seat, but since he was the only student that seemed happy about her announcement she decided to let him off. She handed the notes out to the class and told us we had to bring them back the next day with our parents’ signatures. I stared at the brown piece of paper. A turkey decorated the top right corner. At the bottom, the paper had a box for my mom to check mark if I would attend the activity and a different box to check mark if I would not be attending. I knew for sure my mom would make me go. The thing was, I wasn’t sure if I wanted to or not. I mean, it would be wonderful to see how the Pilgrims lived. And Mrs. Red was right. I doubted I’d get another chance like this. I’d probably have a lot of fun too. But the look on Vinny’s face made me worry. It wouldn’t be so easy leaving behind all the things I loved, like TV and computers. The Smartboys and girls met in our secret hideout during first recess. That’s the unused janitor closet in C hall. Vinny plopped down on the old floor waxing machine. I leaned up against the shelves with empty cleaning bottles. I hesitated, not sure what to say. Vinny’s dad is in the army. There’s been a lot of fighting where he’s stationed. Several soldiers in his unit have died. She worries about him all the time, and I don’t blame her. Sandra turned to Vinny. “Art’s right, Vinny, you can take your cell phone. Just make sure it’s fully charged before you leave. I know that the thought of staying overnight somewhere without my family makes my gut hurt. But just think for a minute how the Pilgrims must have felt when they boarded the Mayflower to leave England. They were probably scared too. They knew they were leaving behind all of their families and the comfortable life they’d lived so far to go off to a wild country where they’d be responsible for their own survival. They’d have to build their own houses. Grow their own food. Take care of everything all by themselves. But they did it. And because of them, we get to live in this great country. Sandra sat down and looked at me. I took the note home to my mom. She got really excited like I knew she would. She loves this kind of stuff. At least this time I wouldn’t have to wear a suit and tie. Thanksgiving break came up all too quickly, and I found myself in the car with my mom, driving way out of the city. It’s kind of strange that we have a Plymouth Reenactment Park here since we’re nowhere near Massachusetts. Truth is some old guy whose ancestors came across on the Mayflower put the park together and donated it to the community. I had printed a topographical map so I could make sure Mom took the right roads to get to the park. While we drove, I spent my time not only telling Mom which way to go but also figuring out where each mountain peak was on the map. The Reenactment Park sat just west of a mountain that looked like a head with two giant ears. Across from the Big-ear Mountain, a sheer column of rock jutted up above the tree line. I found both landmarks on my map and steered my mom onto a dirt road. I’ve always wanted to go on a real-for-real sailing ship like the Mayflower. But mom said there probably aren’t any real ships at the park. Of course not. We don’t even live by the coast. Despite that, the first thing I saw when we rounded the last bend was a sail boat stuck high-and-dry at the edge of the dirt parking area. 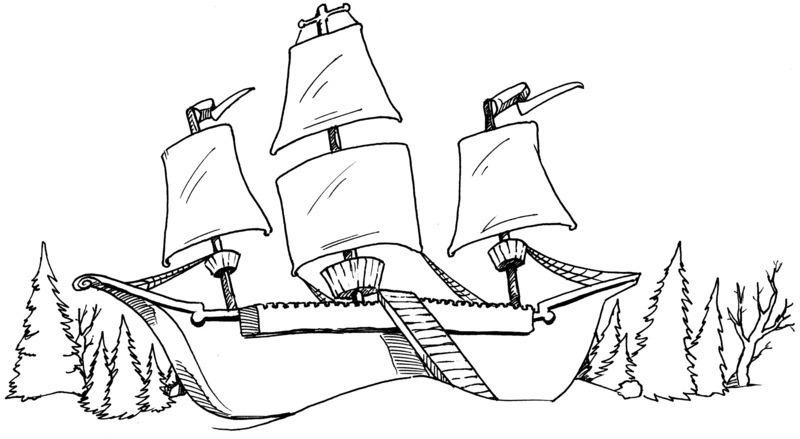 A real wooden ship with three masts: the biggest one in the middle, a slightly smaller one in the front, and the smallest in the back. I reached for my cell phone to search online what all the parts of a sailing ship are called. Too bad for me, no cell phone. My mom had taken Mrs. Red’s words to heart. No electronics of any kind for me during my stay at the park. I’d have to wait until I got home to get the detailed info I needed for our Secret Notebook. As soon as we parked and got out, a strangely dressed kid came over to us. I mean, this boy’s clothes were weird. He had on baggy pants that ended just below his knees. From there down, he wore a pair of thick socks held up by ribbons that tied at the top. He wore strange leather shoes, and that’s just the bottom half. On his head he had a felt hat. A lacy white ruffle went around his neck and hung over a jacket, called a doublet. I think he was trying to say hello, but he had a strange accent. Mom choked. My face split in a big grin. “All right then.” Mom didn’t seem as excited to leave me there now. “Come on.” Bartholomew grabbed my arm and dragged me toward the boat. The scent of pine trees and wood smoke hung on the air. I waved goodbye to my mom as she got in the car and started the engine. Next thing I knew I’d climbed a plank up onto the boat. That’s when I realized the boat wasn’t full-size. We climbed a ladder down into what Bartholomew called the “tween deck.” That’s where the Pilgrim’s lived during their ocean voyage. Bartholomew stopped next to some changing rooms and a row of lockers. “The girls do change on the other side of the ship.” Bartholomew pointed to a wooden wall that divided the deck in half. “Change into what?” I asked. “Into proper clothes, of course. It must be truly embarrassing to walk around half-dressed as you are.” Bartholomew handed me a stack of clothes like the ones he wore. In no time at all, I found myself wearing a white linen shirt underneath a thick doublet. The baggy half-pants were called breeches, and they didn’t even come with a belt. They had to be tied to the doublet to keep them up. The socks didn’t stay up on their own either. I had to use ribbons, called garters, to tie the socks in place. And boy were those socks scratchy. By the time I added the shoes, hat, and the lace collar to the outfit, I looked like I’d walked right out of a Thanksgiving greeting card. At least I was warmer in that strange getup. Bean came down the ladder, followed by Art. They saw me and started laughing. Bartholomew got Bean and Art all dressed in time for Eric Dripp to come down the ladder and make fun of all three of us at once. Bartholomew stopped Eric’s gales of laughter by handing him his own stack of strange clothes. While Eric changed, Bartholomew showed us how to secure all our normal clothes in the lockers. He even made Art take off his watch. Bartholomew said we couldn’t take anything into the park that had not existed in 1620. That made me worry about Vinny. I hoped they would not make her lock her cell phone away on the boat. But even if they did, she’d have a key to her locker and be able to go to the ship and use her phone whenever she wanted to. When Eric came out of the locker room all dressed up like a pilgrim, we laughed back at him. We all looked ridiculous. Bean, Art, and I looked at each other and then stared at Eric. We don’t usually get along so well with Eric. Eric glared at us, called us a bunch of idiots, and followed Bartholomew up the ladder.